The abundance of Centrostephanus and the extent of its impact on kelp beds in eastern Tasmania was re-surveyed by divers and underwater towed-video in 2016/17 and assessed relative to baselines established in 2001/02. The re-survey involved 156 diver transects spanning 13 eastern Tasmanian sites spaced ~20 km from Eddystone Point to Recherche Bay (Fig. 1). From these transects, the abundance of Centrostephanus on reefs within the 4 to 18 m depth range increased from an average density of 1,036 to 1,818 urchins per hectare between 2001/02 and 2016/17. The increase in C. rodgersii has not occurred evenly across the coast and there are many sites in southern Tasmania (Bruny Bioregion) where Centrostephanus remains rare, occurring at densities less than ~20 individuals per hectare. Conversely, across the Freycinet Bioregion to Tasman Island (sites 1 to 9, Fig. 1), C. rodgersii increased from an average density of 1,495 to 2,623 urchins per hectare between 2001/02 and 2016/17. This represents a 75% increase in C. rodgersii density over 15 years in this region, equating to a population increase of 3.8% per annum. Multiplying observed C. rodgersii densities across available rocky reef habitat within the 4 to 18 m depth range leads to an estimated increase in the C. rodgersii population from ~6.7 million to 9.9 million individuals between 2001/02 and 2016/17 (a 48% increase over the 15 year period or an average of ~200,000 urchins per year). Factoring by the average individual weight of urchins in each survey period, this equates to an estimated biomass increase from ~1,850 to ~3,000 tonnes, or an average increase of ~80 tonnes per year. Scaling urchin densities across the full width of available reef (4 to 40m depth), the population of C. rodgersii is estimated to have grown from ~11 million to more than 18 million over the 15-year period (a 60% increase over the 15 year period or an average of ~460,000 urchins per year); equating to a biomass increase from ~3,000 to ~5,500 tonnes, or an average increase of 170 t per year. Inclusive of the sizeable population on Kent Group reefs in Bass Strait, the population of C. rodgersii in Tasmanian State Waters is estimated to have exceeded 20 million individuals by ~2017. 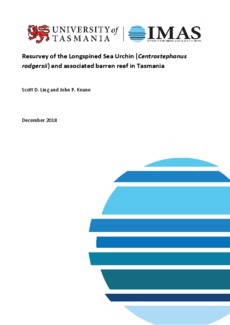 Diver assessment of urchin grazing within the 4 to 18 m depth range for all eastern Tasmanian sites, revealed an increase in urchin barrens cover from 1.6% to 6.3% during the 2001/02 to 2016/17 period. Considering only the eastern Tasmanian sites north of Tasman Island to Eddystone Point where C. rodgersii is now common, diver assessment of barrens within the 4 to 18 m depth range revealed an increase in barrens from 2.3% to 9.0% cover of reef. Using towed underwater video to sample the full width of reefs (from 4-40m depth), the percentage of reef as barrens across sites 1-9 in eastern Tasmania was observed to grow from 3.4% to 15.2% from 2001/02 to 2016/17, equating to a ~10.5% increase per annum over the 15-year period. Increase in the density of C. rodgersii and expansion of associated barrens over the 15-year period was greatest on boulder-dominated reef between 18 to 30 m. Across the eastern Tasmanian coastline, greatest variability in C. rodgersii and barrens occurred from site to site (i.e. at scale of ~20 km), with relatively lower variation in urchin abundance and cover of barrens at finer kilometre (sub-site) or sub-kilometre (transect) scales. Notably, beyond increasing barrens cover, changes to the structure of kelp beds were also apparent between survey periods, with some algal species increasing in cover while others declined. The kelp Ecklonia radiata, which, is an algal type heavily grazed by C. rodgersii, showed increase in cover. That is, while barrens cover generally increased, remaining kelp beds appeared to become thicker as indicated by overall increase in macroalgal cover. This seemingly unintuitive result is likely an ongoing response to widespread decline of giant kelp Macrocystis pyrifera, which historically dominated eastern Tasmania reefs where it outcompeted smaller understorey kelps such as E. radiata. However, giant kelp as assessed by divers measuring coverage of the seafloor was observed to decline by 42% across eastern Tasmania, disappearing from 7 of the 10 sites where it was present in 2001/02. Re-confirming findings of the original 2001/02 baseline survey, low density of both abalone and rock lobster were observed on urchin barrens. Continued proactive management of urchin overgrazing is critical given that removing sufficient urchins to reverse barren grounds becomes increasingly difficult. The observed annual increase in tonnage of urchins has been of a scale that control, such as by rebuilding of predators and upscaling of culling and/ or harvesting would appear plausible. The spatial information on barrens coverage and locations at greatest risk of overgrazing as obtained during this survey will assist further targeted interventions.